Waterfront Lodge Motel offers 3.5 star stylish hotel motel and apartments accommodation in a fantastic, absolute waterfront position in New Town Bay. With its modern style and convenient location, the Leisure Inn hotel is ideal for couples, small families and corporate travellers. Peacefully located beside New Town Bay Marina, with great views of Mt Wellington and the Derwent River - Waterfront Lodge is just 4 minutes travel to Hobart's city centre and Salamanca Place, the Hobart CBD, Battery Point, Salamanca Market, Sullivan's Cove, Wrest Point Casino. 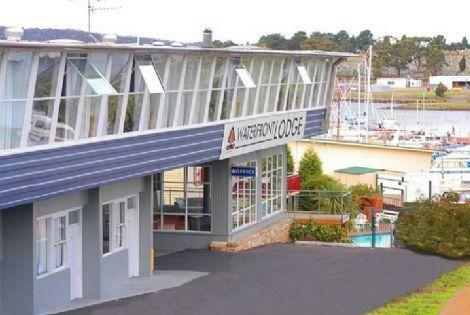 The Waterfront Lodge Motel is close to everything that Hobart has to offer and features numerous guests facilities including outdoor swimming pool, tour desk, bbq and garden. All guest accommodation features a private ensuite bathroom, television, heating, electric blankets, alarm clock, radio, colour TV and kitchenette including microwave, fridge, toaster and tea/coffee facilities. The hotel is a non smoking property, featuring FREE car parking, a guest lounge, guest laundry, tour desk, facsimile service, outdoor swimming pool and barbeque entertainment area. . Nearby Attractions : Base yourself at this great motel and explore Tasmania's wilderness, Derwent Harbour, Mt Wellington, Tassie's heritage properties, the Huon Valley including the Tahune Air Walk, Port Arthur, Historic village of Richmond, wineries, Salamanca Market(Sat only)and much more. Double Hotel Room : Sleeps up to 2 guests on 1 Double Bed. King Spa Hotel Suite : Sleeps up to 2 guests on 1 King Bed. Queen Studio Apartment : Sleeps up to 3 guests on 1 Queen Bed, Or 1 Queen & 1 Single Bed.